Advent Calendar ELves from Garnet Hilll. 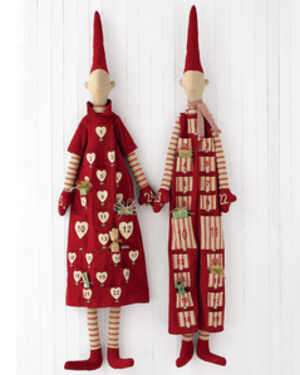 I LOVE these elves, but the reality of making something this labor intensive isn't likely for me. And here's a much simpler, traditional version also from Garnet Hill. This one could be so much fun with embroidered detail on each pocket, don't you think? 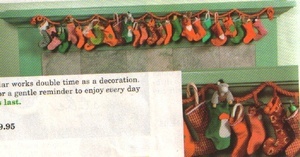 And here's my favorite--a chain of stockings, made by Kathe Kruse. Jessie has one of these that I drooled over last year. I (very poorly) scanned this image from the Chinaberry catalog, though it doesn't seem to be available on their website anymore, and I can't find it anywhere else online. 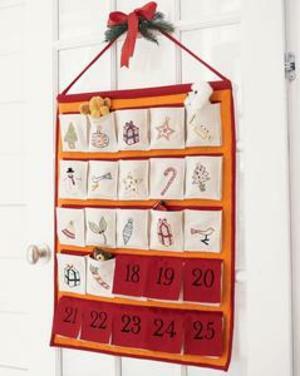 How much fun would this be, in lots of different vintage christmas fabrics? And what a treat to check the stocking each morning for a surprise. I must make it!